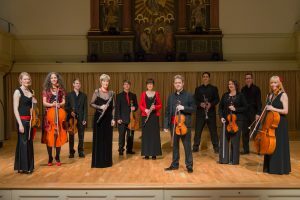 Bristol Ensemble returns to Thornbury to give its annual Autumn concert in the Armstrong Hall, tracing a fascinating musical journey from Baroque times to the early 20th Century. Baroque masterpieces by Bach, Albinoni, Telemann and Pachelbel are represented by Bach’s energetic and playful Oboe and Violin Concerto in D Minor, Albinoni’s lyrical and elegant Oboe Concerto in D Minor, Telemann’s witty Don Quixote Suite illustrating episodes from the opera and Pachelbel’s very well known, serene and joyful Canon. 20th Century English music is represented by Benjamin Britten’s first work, his Simple Symphony, which builds on eight themes from his childhood and includes a tune a little reminiscent to that of a well-known radio farming soap. The Baroque and the 20th Century are drawn together in Ottorino Resphigi’s Ancient Airs and Dances, a piece written in 1931 as an arrangement of Renaissance and early Baroque music that is known for its elegance and brilliance but arranged to be pleasing to a more modern ear. This eagerly awaited concert is part of the fund raising for the Armstrong Hall Redevelopment Project (Phase 1). Tickets £16 each, to include interval finger food, can be obtained from Thornbury Town Hall or by phoning 01454 412272.